The apartment has six beds and consists of double bedroom, bedroom with bunk beds , living room with sofa bed and kitchenette, bathroom and balcony. 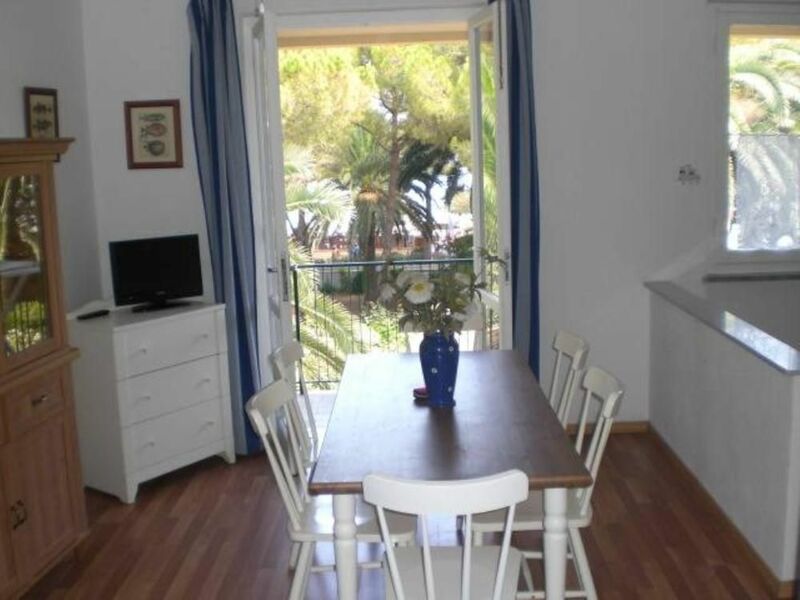 It is fresh and airy thanks for its location on the sea front, and it is also equipped with ceiling fans. It is bright, because all the rooms are equipped with large windows. It is furnished with great care: the parquet floor, modern furniture , elegant tapestries make the apartment warm, pleasant and welcoming. The kitchenette has four gas fires and fridge with freezer. Your pets will be welcome! In the laundry room located on the ground floor of the building, there is a washing machine that guests can use free. It can be combined with a two rooms apartment that is on the same floor of the building or with a cottage with garden that is 50 meters far from the apartments. The apartments occupy a unique and very convenient position for families in the village centre, facing the sea, so you don't need to use the car. The view is beautiful. The apartments are in fact at the second floor of a two-storey building that overlooks a large garden, property of a villa of the early '900, and the sea. You cannot go accross this private garden but, catching up around the block (about 100 meters), you arrive at the large sandy beach in front of our house, that offers both equipped (we are in front of the bathing establishment “Il Capriccio” ) and free spaces. The entrance to the building is at the beginning of the main and pedestrian street of the village, opposite the church. All amenities are within walking distance. Because of its location in the pedestrian area, the apartment cannot offer private parking, but less than 100 meters away, free public parking are available. zentrale, ruhige Lage. Saubere Wohnung mit viel Licht. Kinderzimmer sehr klein. Alle wichtigen Einrichtungen in der Nähe. Auto kann auf dem Parkplatz bleiben. Wir verbrachten zwei schöne Ferienwochen in Marino di Campo. Die Vermieterin ist sehr sympathisch, die Wohnung ist sauber und an toller Lage. Wir empfehlen die Adresse gerne weiter. Das einzige Negative sind die täglichen und lauten Reinigungsarbeiten um 6 Uhr morgens in der Fussgängerzone (Staubsauger, Putzmaschinen(). Appartamento come da descrizione, luminoso, spazioso e in ottima posizione:in centro, a pochi passi dal mare, dai parcheggi e dai supermercati. Sistemazione ideale per chi come me ha bimbi piccoli e cerca comodità e servizi vicini. Inoltre fa la differenza l'enorme disponibilità della padrona di casa e del suo tuttofare che senz'altro hanno contribuito a rendere il soggiorno perfetto!...e poi che dire: l'Elba è meravigliosa! Ho soggiornato con la famiglia nell'accogliente e comodo trilocale nel pieno centro di Marina di Campo e a 30 metri dal mare e devo dire che ci siamo sentiti come se fossimo a casa nostra grazie anche alla gentilezza della Sig.ra Paola la proprietaria dell'appartamento. Sistemazione che consiglio a famiglie. Il primo luglio siamo arrivati a Marina di Campo in cinque, tre adulti e due ragazzi (prima esperienza all'Elba per tutti). Subito la signora Paola, proprietaria, ci ha indicato un parcheggio libero e ci ha accompagnati all'appartamento, dimostrandosi cortese e disponibile. L'appartamento corrispondeva perfettamente alle foto fornite sul sito, ed era pulito, arieggiato e confortevole. Dispone di tutti i servizi elencati sul sito. La posizione si è rivelata ottimale: l'appartamento si affaccia sulla via principale che si snoda per tutto il paese, la spiaggia è (letteralmente) a due passi e i supermercati si trovano nelle vicinanze. La spiaggia è davvero comoda, lunghissima e di sabbia fine. Incantevoli le spiagge di Cavoli, Fetovaia, Capo Bianco e Padulella. Molto belli i paesi di Porto Azzurro e Portoferraio. Marina di Campo è molto animata la sera e offre innumerevoli locali e negozi. Che dire, un'esperienza unica, da provare almeno una volta nella vita! Ferries to Elba Island leave from Piombino Marittima, located between the cities of Livorno and Grosseto. It is situated along the Via Aurelia (SS1) and the exit is called ' Venturina / Piombino / Elba. For those who don't want to ferry the car, on the port of Piombino guarded or free parkings are available. To reach the port of Piombino and ferry to the Island of Elba, you have to change in Campiglia Marittima. Here you can take a train or a bus that will take you directly to the ferry terminal. The airport on the Island of Elba is located in Marina di Campo, in La Pila , which is 2 km far from the center of the village. Two kilometers of white granite sand caressed by the turquoise sea, a typical village, perched on a hill, starry nights, lighted by many lights of restaurants, pubs, boutiques: this is Marina di Campo, the largest and more equipped village of the beautiful southern coast of the island. Only 18 kilometers separate it from the main town, Portoferraio, only two kilometers from the airport of La Pila. In a few minutes by car you can reach the beautiful beaches of Cavoli, Seccheto and Fetovaia. The wide gulf embraces bays and coves accessible only by sea or along footpaths smelling of rosemary, myrtle, juniper, as the beach Galenzana, uncontaminated oasis even in August. From the port of Marina di Campo you can take the boats that go to the beautiful island of Pianosa, with its pristine waters and its fascinating archaeological ruins, the ruins of the Villa of Agrippa, dating from the first century BC, the Forte Teglia, built by Napoleon Bonaparte. The island of Elba is a land for every taste: sportsmen can enjoy themselves with a wide variety of activities, swimming, wind surfing , sailing and canoeing. And then cycling, running, walking, golf, horse riding. For lazy people Elba offers an oasis of relaxation, with its many coves and small beaches, thermal baths (in Portoferraio), wellness centers. If you love history, you can go to visit the two houses of Napoleone Bonaparte, in Portoferraio. Those who love the culinary holidays will surely be satisfied: Elba Island is like all Tuscany, but has some peculiarities, linked to the flavors and scents of its land and its sea.